Those looking for a star piece around which to build their superyacht art collections take note: Sotheby’s are about to auction one of the most important and iconic Edgar Degas sculptures in existence. Petit danseuse de quatorze ans (Little Dancer Aged 14) is one of only a handful of Degas bronzes still in private hands, with similar pieces currently residing in museums including the Tate, Musee d’Orsay and Metropolitan Museum of Art, making this auction a once-in-a-lifetime opportunity. Plus at just 101.3cm tall, it is a perfectly sized piece of art for displaying on board. Considered the most ambitious and iconic of all the artist’s sculptures, the piece was first exhibited to the public at the Sixth Impressionist Exhibition of 1881 in Paris where its unflinching and unpolished realism garnered as much praise as it did shock and controversy for its perceived vulgarity. 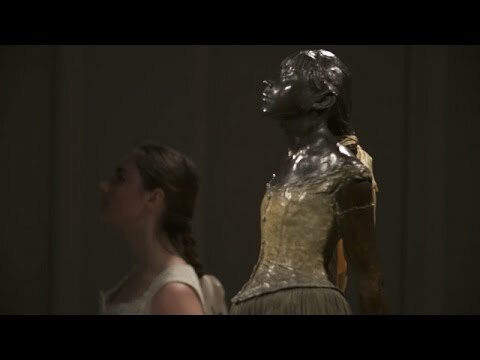 As the only sculpture to be exhibited during the artist’s lifetime, Little Dancer Aged 14 is considered the pinnacle of Degas’ work and, unlike his other three-dimensional pieces, was the result of months of exhaustive sketching, artistic experimentation and research into his subject. Modelled on Marie van Goethem, the daughter of a Belgian tailor and a ‘rat’ of the Opera (as the young dancers were known), the work was originally created in modelling wax using wire armature for the body and hemp for the arms and hands. The figure was dressed in real silk, tulle and gauze with a wig from local puppeteer Madame Cusset before being recast in bronze with a muslin skirt in 1922. The original wax model is now housed at the National Gallery of Art in Washington, D.C. The sculpture will be auctioned as part of Sotheby’s Impressionist & Modern Art Sale in London on 24 June and is expected to achieve somewhere in the region of £10 - £15 million. 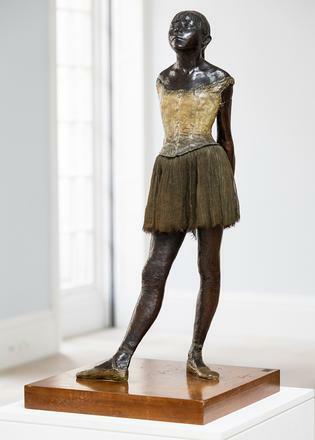 The last Degas bronze repetition to be sold at Sotheby’s London reached £13.2 million in 2009 while Danseuse au repos, a pastel and gouache piece created in the same period as Little Dancer Aged 14, sold for a record-breaking $37,042,500 (£23,892,000) at Sotheby’s New York in 2008. Visit sothebys.com.